Russian physician at the court of Moscow under the czars Alexis Mikhailovich and Feodor Alekseyevich; born in Poland, of Jewish parents, in the first quarter of the seventeenth century; killed at Moscow during the first uprising of the Stryeltzy ("sharpshooters") in 1682. Von Gaden was sent to Moscow from Kiev by the boyar Vassili Vassilyevich Buturlin in 1657. Here he began (1659) his career as a barber-surgeon ("feldscher"). He was soon advanced to the position of surgeon, with a salary of forty rubles per annum and a monthly allowance of five rubles for board. Owing to his popularity he was appointed by the czar as assistant physician (April 1, 1667), and as physician in ordinary (April 4, 1672). Though he had not studied medicine at any foreign university, he received a doctor's diploma from the czar, with an increase of salary to one hundred and thirty rubles per annum and a monthly allowance of fifty rubles. 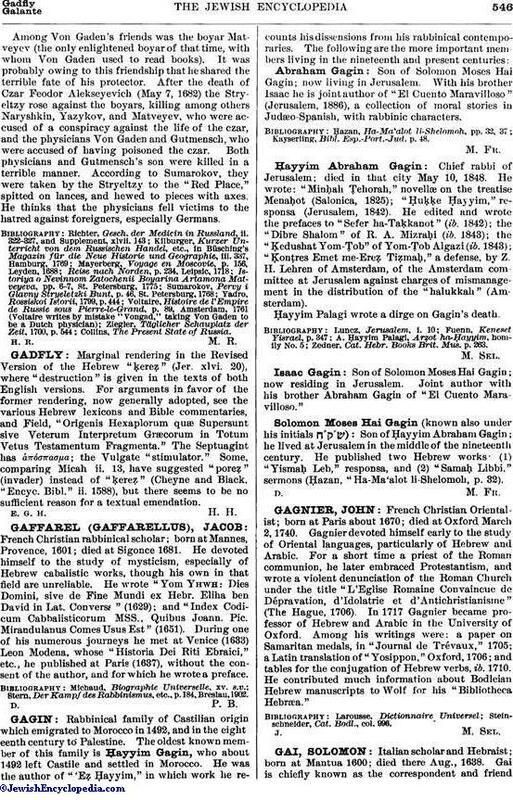 The different names under which he is mentioned are explained by the fact that he repeatedly changed his religion—from the Jewish to the Roman Catholic, from the Roman Catholic to the Lutheran, finally entering the Greek Orthodox Church. 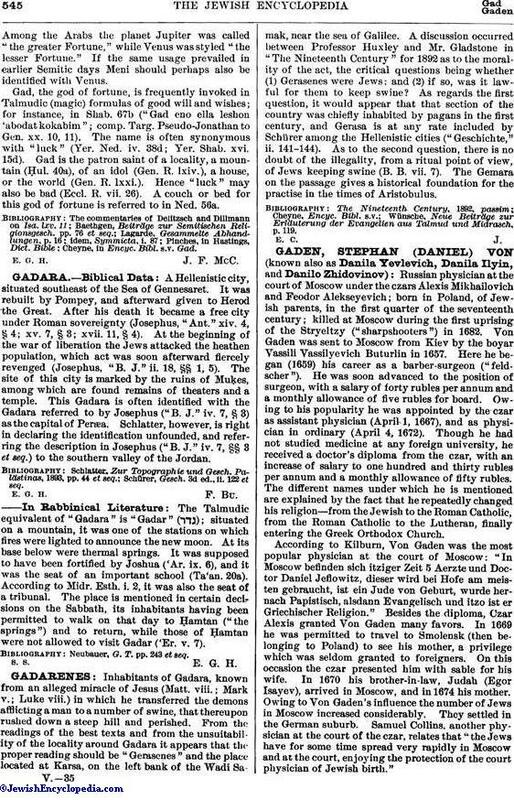 According to Kilburn, Von Gaden was the most popular physician at the court of Moscow: "In Moscow befinden sich itziger Zeit 5 Aerzte und Doctor Daniel Jeflowitz, dieser wird bei Hofe am meisten gebraucht, ist ein Jude von Geburt, wurde hernach Papistisch, alsdann Evangelisch und itzo ist er Griechischer Religion." Besides the diploma, Czar Alexis granted Von Gaden many favors. In 1669 he was permitted to travel to Smolensk (then belonging to Poland) to see his mother, a privilege which was seldom granted to foreigners. On this occasion the czar presented him with sable for his wife. In 1670 his brother-in-law, Judah (Egor Isayev), arrived in Moscow, and in 1674 his mother. Owing to Von Gaden's influence the number of Jews in Moscow increased considerably. They settled in the German suburb. Samuel Collins, another physician at the court of the czar, relates that "the Jews have for some time spread very rapidly in Moscow and at the court, enjoying the protection of the court physician of Jewish birth." Among Von Gaden's friends was the boyar Matveyev (the only enlightened boyar of that time, with whom Von Gaden used to read books). It was probably owing to this friendship that he shared the terrible fate of his protector. After the death of Czar Feodor Alekscyevich (May 7, 1682) the Stryeltzy rose against the boyars, killing among others Naryshkin, Yazykov, and Matveyev, who were accused of a conspiracy against the life of the czar, and the physicians Von Gaden and Gutmensch, who were accused of having poisoned the czar. Both physicians and Gutmensch's son were killed in a terrible manner. According to Sumarokov, they were taken by the Stryeltzy to the "Red Place," spitted on lances, and hewed to pieces with axes. He thinks that the physicians fell victims to the hatred against foreigners, especially Germans. Collins, The Present State of Russia.